Do not prefer this program compared to others, although it works. I have actually switched for the time being from winamp to this.winamp has been giving me directx errors right after i upgraded from 5.5 to 5.51.
wmp works fine and i really never noticed all the new features until now. the toolbar feature is good. It's pretty good, but still has a few bugs in it, and crashes randomly if you're watching very large videos, or if you have the DFX plugin, other than that, its an awesome version of media player, and it's an essential if you like listening to music. It automatically searches for your music and videos, and puts them into your library. Definately worthe the upgrade from WMP 9 or 10. If you want to enhance the sound of media player, use the enhancements integrated which dont seem to make much difference, or you could use DFX 8.0. 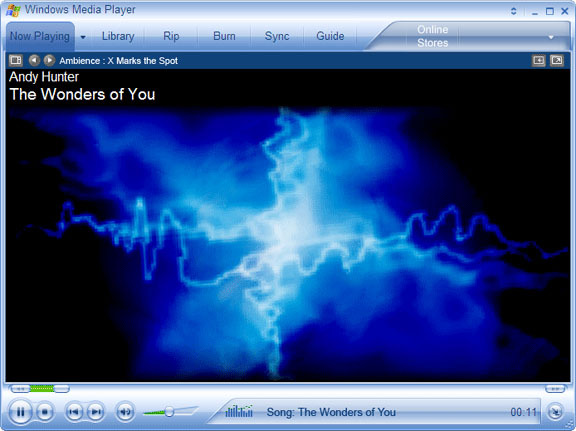 I really love windows media player, and always have. Only reason I don't use it for everything is because I have a very old computer, and WMP is fairly resource intensive compared to apps like XMPlay and Media Player Classic. Instead of using this, get the K-Lite Mega Codec Pack which will easily install Media Player Classic, along with the codecs you'll need, for video. If you want a nice separate audio program with eye candy, get WinAmp. If you purchase music through URGE (or iTunes), learn about DRM and stop supporting it. I don't want to trash Microsoft like a lot of people, this media player is alright, but people often get it thinking it's simple, and it's actually a lot more complicated than programs like Media Player Classic, but not necessarily more powerful. WMP11 is a great program. I remember when earlier versions wouldn't even work properly with third party codecs. If you have a DVD codec installed, WMP11 makes a great DVD player. Though not really Microsoft's fault, some codecs (ffdshow?) can cause WMP to crash. The solution is to uninstall those codecs and use other ones, either a different ffdshow or Divx. This same issue can also cause Explorer (not Windows Explorer) to crash and the fix is the same. This is NOT a site that Microsoft manages. If someone makes a mistake on the version number or jumps the gun on the release date, don't trash a pretty good program, okay? I think it would be respectful to change your score and just give WMP11 what you think it deserves. My scores are always adjusted by price, so consider that PowerDVD 7 Deluxe at $70 is almost the same price as OEM Win XP Home which can be purchased for as low as $85? **For all you people that don't know about OEM purchasing, listen up. Windows can cost less than half the price and the only difference is the packaging and the inability to upgrade an existing installation of Windows 98. I recommend fresh installations anyway. Also, certain hardware (especially hard drives) can be purchased as OEM. I just bought a 320GB Seagate SATA drive (perpendicular) for $90. After downloading this "update" the version shows 11.0.5721.5145. That is the same version previously released. Is there a update version 5146? If so, where is it? Maybe this was a mistake. I gave this download a 1, because it does not appear to be a real upgrade/update. Isn't that a screenshot of WMP version 10? I like WMP11. Really the first time I've switched to using WMP for playing my music. Plus the black GUI is pretty sharp looking. In it still says version 11.0.5721.5145 after installing this...?? Anyone care to comment on any possible speed increases for this release (from previous posts its sounds unlikely but I thought I'd ask)?